Toyota Granvia and Regius For sale UK Registered direct from Japan including the Turbo Diesel and Petrol engine versions by Algys Autos Ltd, THE Best Value in the UK. FACT. Your search for the best quality and prices for Toyota Granvia for sale UK Registered starts and ends here! All available via our unique ‘Import Scheme’. All Toyota Granvia & Regius Models Available for Sale in the UK Via Algys Autos. The UK Premier Importer supplying direct from Japan for over 20 years! 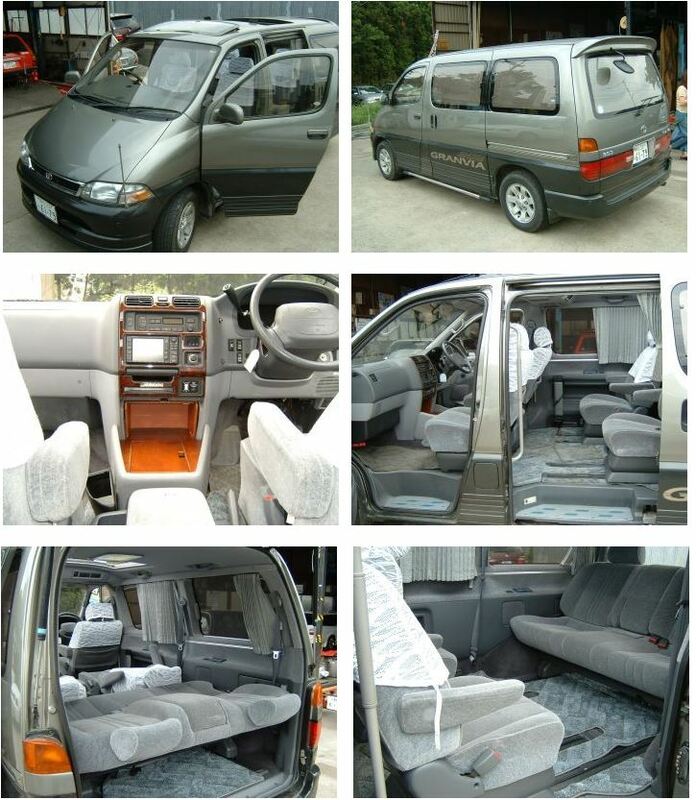 To see the Toyota Granvia and Regius in UK Stock available for sale see Stock link above. Algys Autos Ltd supply quality Toyota Granvia and Regius for sale UK registered in both 2 and 4 wheel drive, 7 or 8 seat versions. 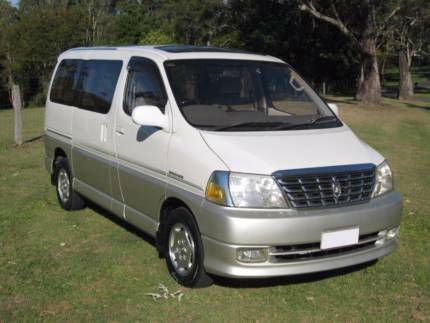 The Toyota Granvia and Regius is actually a Toyota Hiace Regius, Granvia 1995-2001. Car manufacturers often make one car but give it several different names and sometimes a slightly different appearance, but they’re really the same under the skin. 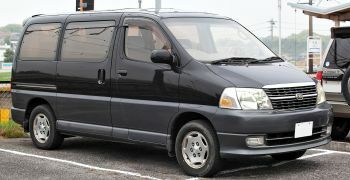 The Toyota Granvia is considered by many to be a Big ‘Step-up’ from the Toyota Estima Generation 1. The Power is considerably more with the 3.0 litre diesel engine devleoping 130 bhp as opposed to a mere 90 on the Estima. There is also Toyota Granvia with 2700 & 3400cc Petrol engines.The interior trim levels are higher too with an ‘Executive’ feel. 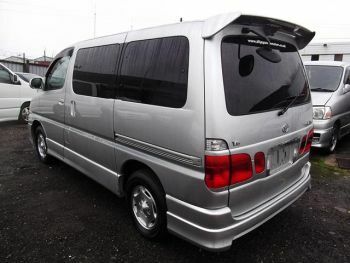 Those that wanted a more luxurious MPV than the Generation 1 Toyota Estima and looked towards the Toyota Granvia or Toyota Regius found they were finacially out of reach to most that considered a lovely family mpv but now thanks to Algys Autos Import Scheme it is at the cost of a Toyota Estima or similar purchased from any other UK garage source! We are here to help you save BIG £’s on your quality Toyota Granvia. Your search starts and ends here! What sets Algys Autos Ltd apart from the rest? That’s Simple, Algys Autos import only fresh stock direct from our Japan garages NOT from very inferior UK auctions or from Toyota Granvia & Regius circulating for sale within the UK. Most UK traders buy their Toyota Granvia from the used UK market, generally these cars are tired and have been subjected to the cruel and harsh winter roads and conditions. We are the UK Importer & Supplier for more than 20 years, it is not possible to buy better quality or prices than from ther UK supplier! 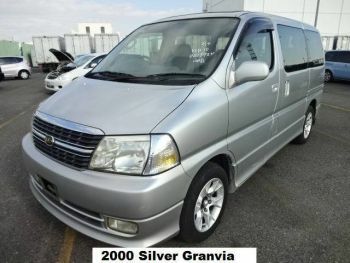 If you do look elsewhere, ask to see the Japanese auction sheet and proof they imported the Granvia from Japan…..if they can’t or won’t provide it, turn around, walk away and come to the experts. 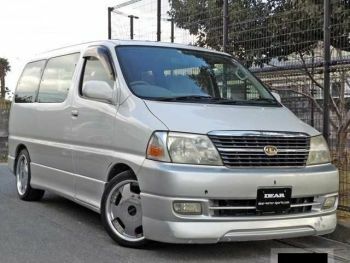 Contact us via email and ask for our stock list of cars arriving weekly into the UK, we always have a minimum of 100 Mpv including Toyota Granvia for sale and en route to the UK at any given time!! Many ask what the difference is between the Toyota Granvia and Regius. Basically they are VERY similar, both having the same engine, running gear and most of the interior comforts. 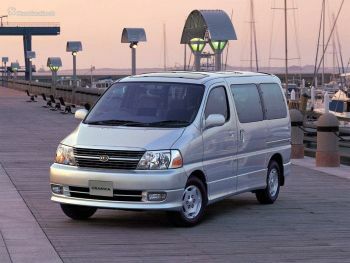 The Toyota Granvia is 10cms wider than the Toyota Reguis and 10cms shorter, otherwise they are very similar indeed. 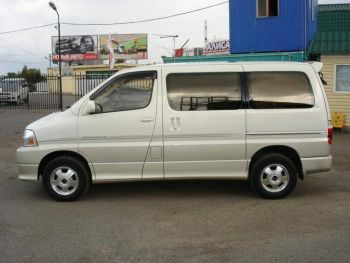 Both the Toyota Granvia and Toyota Regius start from 1995 to 2002 and are available with 2700cc petrol, 3000cc turbo diesel and 3400cc V6 petrol engines. They both have 2 or 4 wheel drive options and 7 or 8 seats. There are also additional extras on some like coolbox, sunroofs, spoilers etc. Algys Autos can import and supply any of the Toyota Granvia or Toyota Regius for sale fully UK registered direct from Japan. Click here to Email for the No-Obligation email list, changes daily! 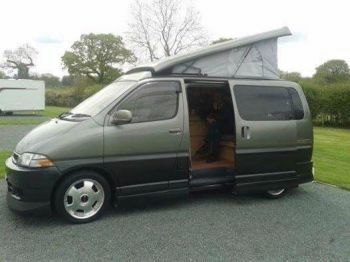 There are 2 ways to consider having a Toyota Granvia in the UK with a camping conversion. Both options come to your persinal specification with gas cooker, sink, waste and table. 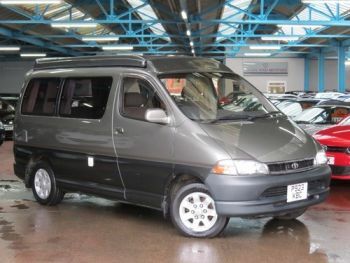 The Toyota Granvia can be imported for you from Japan, fully UK registered and then either delivered to your home or the location where you may have chosen to have the Camper Conversion installed. We really have no objection to delivering the Granvia for you to another camper conversion specialist as you wish. Alternatively you can choose to have the Camper Conversions conducted at our Bristol garage in the UK. The UK conversions are new and to UK specification. We can also install an elevating roof if you wish, The interior conversion is after market and so are removable. 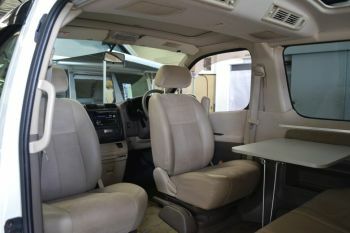 They are luxurious and have many more options and features. Arrangements and specifications can be tailor-made to fit your requirements and budget. Remember we can install a Brand new elevating roof into any Toyota Granvia or Toyota Reguis model completely fitted and trimmed at our Bristol Garage upon UK arrival. This is completed whilst the car is being registered for you, so no delay in delivery to you. See the tintop versions, add about £3000 and you will have a brand new elevating roof version. Our prices are thousands cheaper than anyone else. Check for yourself! call our Garage to get accurate details 01179 382542. 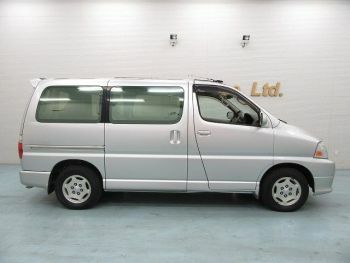 Algys Autos always have a constant flow of Toyota Granvia and Regius available for sale Via our Unique Import Scheme within the supply chain either just into Japan stock, en route via Vessel or putting into UK port. To be honest it is incredibly difficult to keep the website daily current as stock literally changes constantly, For an accurate list always email us for a no obligation list and be put on the daily email list. See current Toyota Granvia and Regius in stock at top of page clicking ‘Stock’, If you want advance notifications of stock as it becomes available contact us via Email Here you will also get the opportunity to see a full set of photos and details showing the Toyota Granvia or Toyota Regius of your choice in the comfort of your own home to see time and again. These is NO obligation to our email service, advice or the YouTube videos. Look you’ve seen the cars and prices…….. surely you got the idea by NOW! Algys Autos Ltd is by FAR the best UK value available!! How? We are the Major UK Importer & Supplier for over 20= Years, we have garages in Japan and the UK. NO middle-men. We have the FULL infrastructure in place and we are not greedy. £350 profit per car SIMPLE. Try asking another dealer how much profit he’s made on a car! IF you still need convincing check out our current stock list as above or via email. No obligation, just email us and ask for the latest Toyota Granvia UK email list. Not difficult is it. And then get a grip on yourself and call or email, ask to be put on the daily email list.